Mark S A Smith: Our guest today is Betsy Westhafer, who is the president of The Congruity Group. She helps companies put together executive level customer advisory boards to figure out where the market is going, and how to make the most money, and not get disrupted disrupting your competition. She has a brand new book out called Prophetability. But wait, it’s spelled differently than you think. It’s spelled P-R-O-P-H-E-T, Prophetability, that’s the ability to foresee the future. The Revealing Story of Why Companies Succeed, Fail or Bounce Back. 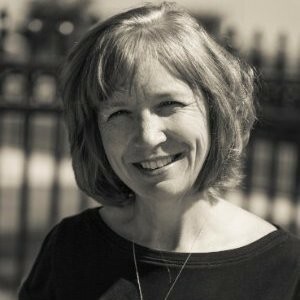 She has helped organizations put together the executive level customer advisory boards all around the world, middle east, Europe, Latin America. She’s a professional speaker. She’s also had experience in founding and executing a company in the legal industry. Welcome Betsy. Betsy Westhafer: Thank you Mark. I’m so glad to be here today. Mark S A Smith: You’re welcome. Betsy is a fan. She’s one of my binge listeners too. And I thank you for being here. She was also a colleague when Ruth and I had a relationship over the past few, we’ve had a lot of fun. I’m so glad we can have you on the show. Your book is a perfect excuse to do so. Tell me about how you came up with the concept of prophetability? I love this idea. Betsy Westhafer: Thank you. We’re really excited about it. And we’re getting really great feedback on the title, ’cause people get what we’re trying to get at with it. My co-author and I, Tony Bodoh, were talking about how important it is for companies to really see what’s in the future. Tony made the comment to me, “much like the prophets back in the day”. And I don’t know where it came from, but it just clicked in my head, prophetability. And he’s like, “Done”. We had the title for our book. It happened that fast. Yeah. Mark S A Smith: Now keep in mind listeners, you have listened to Tony Bodoh in the past. He is one of my favorite people to talk with. You’ve got to go back and listen to his show about crafting five star customer reviews. And it’s really … it’s all like the best of you and Tony have gotten together. And you’re right. We have to see what’s out there in the future. One of my favorite topics to talk about today is simply this. The executives must have top sight and foresight if they’re going to steer their company. Top sight is the ability to have that 30,000 foot view of understanding exactly where we are right now, all the details of the organization. And then foresight, where they want to drive the company for future success. And of course, you want to drive the company where customers will be. Mark S A Smith: Like Wayne Gretzky said you want to stick where the puck’s going to be. Well, a CEO wants to drive the company where there’s going to be a crew of customers that are hungry for the product with money they can’t wait to spend with you. A CEO of an organization is an awful lot like a GPS. Now, a GPS can’t help you unless it knows two things, where you are and where you want to go. And so, this concept of prophetability, knowing where you want to go exactly, driven by wherever the customers are going to be, to me is magnificent. Tell me about what you have discovered as you wrote this book Prophetability? Betsy Westhafer: One of the things that’s really come to the forefront in all of this, for us writing the book, is about the human experience. And Tony made the comment when we were talking about how, in the B2B world, we say, “Oh, we’re B2B. We do business with other businesses.” But really, we’re doing business with other people who work in other businesses. And so the whole human factor is something we’re really diving deep into in the book. And then, the other thing is, from a profit standpoint, is making sure that you have the right people on your team that have the ability to help you see into the future, and then also leveraging the asset of your customer base, because they are your assets. Who better to help you understand where the future’s going than the people who are paying for your products and services now and into the future? That’s the leverage of the executive level customer advisory board, because you have a room full of people that are also looking three to five years out, and their peers, and they’re sharing information that can only be shared under an NDA. That’s what we use to do the prophet thing, being able to leverage those assets, your people and your customers, to help you as a CEO see three to five years out. Mark S A Smith: I think that’s a really important distinction here. It’s not just from an executive level from the company that you work with. It’s an executive level with the customers you’re working with. Mark S A Smith: That’s an extraordinary distinction between the two. Bringing the executives into a room and allowing them to bare their souls is a challenge. Betsy Westhafer: Yeah. But it’s also the value that comes with being part of an executive level board, because they don’t get a lot of opportunities to benchmark with their peers, become a thought leader in front of their peers, and get a peak behind the curtain of a strategic partner or key supplier, having the chance to have some social interaction and develop relationships with their peers. There’s some research that pointed to the fact that the number one reason that executives will give up their time to be on an executive level advisory board, is because of the ability to be peer to peer around the table. Mark S A Smith: The reality is the world of executives is a rarefied airspace. There’s not a lot of them out there. And the reality is that most people don’t know how to have conversations with executives. The reason why is they can’t think three to five years out. Mark S A Smith: You and I travel a lot for a living. I fly first class every time I get a chance, for a lot of reasons. Not the least of which is the people that I sit beside in first class. I’m frequently talking to executives, people that have high cognitive capacity. And the question I always ask them is this. What’s new and exciting? And I will know very quickly where they are with their brain set depending on the answer. If they talk about the weather’s good or not much, you’re not an executive. If they talk about [inaudible 00:05:47] putting together some really interesting points for the next couple of years, I know I’m talking to somebody who’s extraordinary. Mark S A Smith: Weekly and monthly numbers. Betsy Westhafer: Yeah. Monthly numbers. We have other guys looking at the product road map, and the marketing guy or girl may be looking at the technology that they’re going to need for marketing a year from now or two years from now. But the only person really paid to think three to five years out is the CEO. Mark S A Smith: They’re the only one. Everybody else is a shorter time frame. Mark S A Smith: Every one of them. Everyone else is looking zero to one, one to two, maybe two to three if you’re responsible for facilities, and that’s about it. Betsy Westhafer: If you’re not looking three to five years out as the CEO, then you’re ripe to get picked off during disruption. Right? Mark S A Smith: Talk to me. You’re going to get blindsided. Betsy Westhafer: If you’re not seeing it- yeah, exactly. Mark S A Smith: As you built this prophetability insight, the ability to be a prophet, what are some of the two things an executive can do to have better foresight, to have better vision? Betsy Westhafer: A lot of it is aligning the team that they have. So, that’s another benefit of an initiative such as a customer advisory board, because it forces the internal team to hear from the customers at the same time and the same context. And that’s one thing that really helps the CEO, because then the vision becomes very clear because they’ve all heard it in the same way. So that’s one thing. Another thing is surrounding yourself with other CEOs where you’re having these conversations. And it doesn’t have to be in your same industry necessarily. In fact, it’s honestly better sometimes if it’s not people in your own industry because then you start hearing things that are tangential to what you’re doing that may impact what you’re doing. Having those three to five year discussions on a regular basis is one of the best things that they can do to make sure that they are out in front. And what’s beautiful about it is if they’re out in front, the odds that their competitors are out in front also, go down. And then, the customers, when they get there, your company’s there to meet them. So, you’re out in front of your customers. Mark S A Smith: This concept of creating a future with your customers is extremely exciting. What better way to generate the perfect outcome than to sit down with your executives of your customers to create that outcome that the two of you wish to go to, or the six of you, or the 18 of you wish to pursue together, knowing that you’re better as a pack. That reminds me of the African wisdom of which: if you wish to go fast, go alone; if you wish to go far, go with others. Betsy Westhafer: And that’s what’s so exciting because then it gets their brains moving in different ways that they can’t do … it’s through no fault of their own, it’s just human nature. But when they’re in their own bubble, they can’t really see what the customer sees. And so, when they have these open dialogue conversations where anything is acceptable to put out on the table because it’s all under NDA, it really gets the wheels spinning for the host company. Mark S A Smith: Yeah. And besides that, we’re creating a future that doesn’t really exist, and reason and methods that haven’t been yet invented. We can do anything we want. [inaudible 00:09:39] about the future. Betsy Westhafer: We do a lot of sessions where we use innovation games. One session we did, this was several years ago, we laid out craft paper and scissors and ties and markers and crayons, and had these teams on the board get up and innovate, and then present their innovation to the rest of the team. And then, we had fake money where they voted with their money on which idea was the best. From the host company’s standpoint, it was like having a little miniature R&D session with the companies that would buy their products and services. So, it’s very powerful. We make these meetings fun, engaging, interactive, making sure it’s not just a presentation, it’s not a sales event. We really want to hear what’s in your head. Betsy Westhafer: I love it. Mark S A Smith: …during the two days, because what we have to do is break our patterns. To innovate, we have to think beyond our here and now. And this concept of using innovation games is a great way of doing it. Ask any of my clients, I show up with a box of toys. They always initially resist it. But by the end, I leave the box of toys for them to use for their future meetings. Betsy Westhafer: Oh. That’s awesome. I love it. I love that. Mark S A Smith: One of the things that you [inaudible 00:11:01] your book was the revealing story of why companies succeed, fail, or bounce back. Give me a couple of insights here on why they fail or why they bounce back. When you talk about the things that cause them to succeed, let’s look at the other aspects of that. Betsy Westhafer: We have several stories of companies in the book. The most notable recent example is Toys R Us. Mark S A Smith: Bummer dude. Betsy Westhafer: Yeah, exactly. They were asleep at the wheel quite honestly. They did not see where this was going. And then, to announce a bankruptcy two months before Christmas, where then all their competitors just made all the toys loss leaders, so that they could get people in the store. And Toys R Us doesn’t have the ability to do that because that’s all they sell is toys. So they had a miserable horrendous holiday season as a result, because people didn’t want to, A, pay more, or B, pay for something that they might not be able to return. So if they had been out three to five years, they could have changed their business model and perhaps done something that could actually compete. Mark S A Smith: Woo hoo! That’s such a great thing. Betsy Westhafer: Yeah. And he graduates Sunday. I can’t wait. I love that generation. I have five children and they’re all millennials. I have a real affinity for that age group. Plus, I just learn so much from them. Mark S A Smith: Right on. Yeah. You and I have a lot in common. So I have five children, all millennials. I consider myself to be a millennial in a boomer body. Betsy Westhafer: Yeah. I love it. Yep. Mark S A Smith: That is part of what we have to do. We have to embrace where the world is going. And it’s really easy from a prophetability standpoint, so foreseeing the future, to know that millennials are going to change the world rapidly, and most of it, for good. You have to embrace that. You have to have that as part of your conversation. How many millennials do you see at the executive level today? Betsy Westhafer: More than we used to. My son is actually the CEO of his own company that’s just crushing it right now and he’s 31 years old. I think mainly because my perspective is I’m seeing the people he’s running around with that are doing some of those great things. And they’re not just executives in plated title, they’re actually doing executive level work. I’m just really impressed with this generation. Mark S A Smith: Right on. This next executive strategy is something I’ve come in with 20 percent of my attendees are Millennials. Mark S A Smith: Twenty percent. Mark S A Smith: Yes, amazing people that are running companies or forming companies. And they are hungry for the insights on how to run the company better than what they’ve experienced in the past. And I’m seeing magnificent results with these folks making these transitions to the view of being an executive. It’s such a thrill to be part of it, as you know, in the classes that you teach as well. Let’s go back to your book. Share with me a couple of ideas that a listener can use to improve their ability to foresee the future. Betsy Westhafer: Well, of course, my personal bias is the customer advisory board. I just think that is so, so powerful. But on the work that Tony does, he does this brilliant work around customer experience, and analytics, and data and the whole spectrum from the user level, all the way up to the strategic level, it’s important that the CEO understands all of it. They don’t have to get down in the weeds themselves, but they have to … what we refer to as get unfiltered information, where they’re not just getting an NPS score, they’re understanding why is that, and staying with customer satisfaction. And all the metrics and the data mean nothing to the CEO if he doesn’t understand the why behind it. And the why may be deeper than market conditions. It may be back to that human experience. The CEO really has to understand, even if it’s at a transactional level, it still matters very much. And it also matters at the strategic level. So just understanding that whole spectrum, which is why when Tony and I … We got talking and the work he does and the work I do covered the whole spectrum. And that’s why we decided to come together and write this book. Mark S A Smith: Excellent. CEOs have to understand both the strategy, what we’re doing and why we’re doing it, as well as the customer interaction, why the customers are purchasing it and how that fits into their strategy. So listen, strategic alignment between your company and your customer’s company becomes such a critical aspect to your success. And it’s when those things are out of alignment that things fail. From my experience, and I want to see what your experience has been, this misalignment occurs when an executive stops having communication with his customers and relies on the people who are looking one to two years out to drive the ship. Mark S A Smith: And so, you have to get back into that long term. Where are my customers going? And then, how do we get there? If you’re going to make this a success. I love this conversation. It really is timely for me. And without a doubt, our listeners are going, “Yeah, it’s timely for me too. I really need this information.” What can our reader expect to get out of your book? Betsy Westhafer: Something that is very human centric, for one. And maybe not the usual conversation that goes on around customer … When people are having customer conversations, it’s a different way of looking at something. We go into somebody’s strategies. It’s one thing to put it out there in theory. But we actually go into the book on some strategies on how to do these things, how to become a better listener, how to get that unfiltered information. We write a lot of stories in this book about companies. We’ve got to bounce back story of IBM. Now, they just announced a big layoff, so that doesn’t mean that they’re where they want to be. But years ago, they brought in a CEO who really cared to listen, and it was because he had been customer. Mark S A Smith: Let’s talk about layoffs for just a moment. Mark S A Smith: Anytime a company makes big radical changes in the organizational structure, there will always be layoffs. And the reason why is because in my experience, a third of the people can’t make the transition. A third of our all in, when they’re saying in, I thought I’d have to leave. Thank you for making this change. And a third of them are on the fronts. And a company who is smart is going to dump the third that can’t make it as fast as possible. Here’s your two weeks, don’t bother to check back in. And the other third that are on the fence, are then going to be able to make it. But the challenge is that when companies go slow, and they have the naysayers hanging out, and they poison that middle third, then which case you drive all of your assets down. That’s one of the things that I see causes failures is slow to cut the people that can’t make the trip. Betsy Westhafer: That’s a really interesting point because in that book we talk about Kings, Priests, and Prophets. And the King being the CEO, the Priests are the ones who are generally tasked with keeping status quo and the traditions and the culture and that kind of thing, and so they aren’t quick to adjust because they generally like things as they are, because it’s previously been working. And then you have the Prophets. And those are the people that are like, “Yeah, that doesn’t work anymore. We need to mix it up.” And those are the disruptors. The Prophets are really the disruptors. Mark S A Smith: I like that metaphor. And so listener, you may wish to identify who are your Kings and Queens, who are your Priests and Priestesses, and who are Prophets and Prophetesses. Mark S A Smith: That in itself is a very interesting strategy to identify mindset. Betsy Westhafer: It’s really important for alignment because the rub comes with the people that are trying to preserve this status quo and the people who are wanting to disrupt things. And that’s where, if you can’t get your whole team in alignment, then that infighting starts and there’s that tension between those two mindsets. Mark S A Smith: Excellent. Excellent. Excellent. What else do you want our listener to know about your book so that they run down to their bookstore and they pick up a copy, or they go to Amazon if they don’t care about their book store’s longevity? Betsy Westhafer: Yeah. Exactly. Well it’s something that sparked a thought when we were talking about the millennial generation. If you’re a CEO, you’re not looking at the millennials, you’re looking at the 12 year olds and the 15 year olds. One of the stories that Tony tells is his daughter is vegan. Mark S A Smith: Hilarious stories about his vegan daughter on Facebook. Betsy Westhafer: Yeah, oh my gosh, he’s so funny about it. They are going to not just be influencing their parents buying decisions, but they are going to be making their own buying decisions five to seven years from now. And so, we talk about the fact that Nestle has announced that they will use nothing but cage free eggs by 2020. That’s a big big change, and that is specifically to address these kids who aren’t even purchasers yet, but they will be. They will be voting with their money in the next five to seven years. Mark S A Smith: How stunning. What a radical shift in activism, consumer activism, driven by children who have been taught that this is a human way of raising food. Mark S A Smith: I think that the future is extremely bright. Betsy Westhafer: I do too. I couldn’t agree more. Mark S A Smith: I love that. That’s a really interesting insight, if you’re a CEO looking at the future, you’re not looking at millennials, you’re looking at 12 year olds. Betsy Westhafer: Yep. They will have purchasing power. Mark S A Smith: They already do. Betsy Westhafer: Yeah. They already do. They’re influencing purchasing decisions right now with their parents. But then they will have their own money to make their purchasing decision in short order. And if you’re not looking at that and looking at what matters to these 12 to 15 year olds, you’re going to get left in the dust. Mark S A Smith: It’s things such as Minecraft that are setting up these youngsters to be able to do trade, and to communicate with people without knowing their language. We are communicating via emojis. We have generated a world wide language with emojis. Betsy Westhafer: Yeah. Oh yeah. Mark S A Smith: And I can communicate with anybody by whipping out my telephone and selecting emojis. We all know. It’s the coolest thing. That’s a disruptive future friends. The future is absolutely bright, especially when you have the concept of Prophetability: The Revealing Story of Why Companies Succeed, Fail or Bounce Back. Betsy, how can our listeners get ahold of you? Betsy Westhafer: You can reach out to me via my website, thecongruitygroup.com or Betsy@thecongruitygroup.com. Mark S A Smith: Tell me, where can I find your book? Mark S A Smith: What’s your parting shot for our audience? 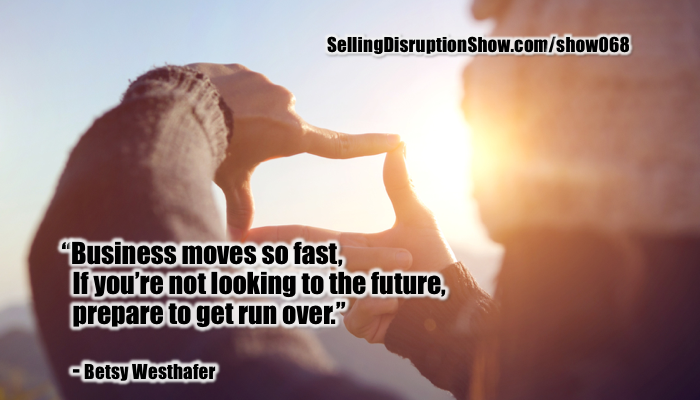 Betsy Westhafer: When I’m talking to CEOs, the most important thing I say is, “If you’re sitting still or you’re not looking way far out, just prepare to be run over.” The speed at which business is moving right now is so phenomenal that there’s just no time to breathe. You have to be looking out all the time. And complacency is the death knoll for a business. Betsy Westhafer: Yeah, exactly, yeah. Mark S A Smith: I’m so delighted to have this conversation. 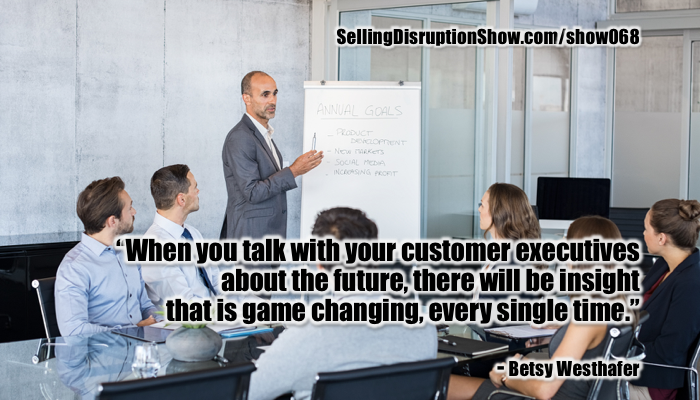 Thanks for being a great guest on the Selling Disruption Show. Betsy Westhafer: Thank you for having me Mark. I really appreciate it.